Celebrate a gaming icon with this days of play PlayStation 4 Console. The Slim blue unit features the Controller button symbols in Gold along its side, while the 1TB hard drive provides plenty of room for all your favorite titles. 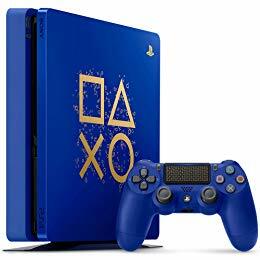 Complete with a matching dual shock Controller in the same bold blue Hue, this limited Edition days of play PlayStation 4 Console is ready to go right out of the box.